1. The numbers from 1 to 9. Badix, Professor Metrolog and Miss Validus. 2. Matching marbles and birds, from 1 to 9. 3. The numbers from 1 to 9. Writing and pronunciation. 4. Pronunciation of the numbers from 1 to 9. 5. Count the number of birds and type how many there are. Say the number. 6. A cake for several birthdays. 1. Adding up to totals of 9 and less. 2. Adding up the number of birds on the two branches. 3. Total of throwing 2 dice. 4. Use the same colour in the boxes with the same total. 1. Introducing units of ten. The numbers from 11 to 19. 2. How many marbles in the box? I put them away, I write the number and I say it. 3. Introducing the zero. To represent, write and pronounce 1 to 6 units of ten. 4. Represent type and pronounce the age of the members of the Cochet family. 5. Pronunciation of the numbers from 10 to 69. 6. Additions without retention with a total less than 70. 7. The total of a throw of 3 dice. The numbers from 1 to 99. Additions without carried numbers. 1. Introducing units of ten: 70, 80, 90. 2. To practice the numbers from 70 to 79. 3. To practice the numbers from 80 to 89. 4. To practice the numbers from 90 to 99. 5. Addition with a total less than 100 without carried units of tens. 6. To complete a number to the nearest unit of ten. 7. 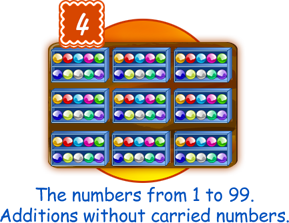 Learn the numbers from 1 to 99 by playing Bingo. Additions with carried numbers. Mental arithmetic. 1. Addition of two numbers less than 9. 2. Addition by mental arithmetic . 3. Introducing addition with carried numbers. 4. Adding up two numbers with a total less than 99. 5. Adding up three single-digit numbers on Badix and typing the result. 6. Adding up three numbers on the slate . 7. Using the same colour to fill in the boxes with the same total. 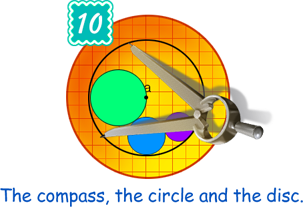 Discover the basic geometry tools. 1. 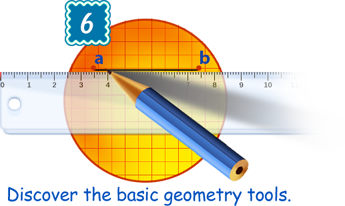 The point, the ruler, the pencil and the segment. 2. Draw the segments joining 3 points to make a triangle. 3. Measure the length of a segment. 4. Measure the sides of a given triangle. 5. Reproduce an isosceles triangle and a right-angled triangle. 6. Points in a line. Find and draw 3 straight lines with 3 or more points. The set square and the right angle. The rectangle and the square. 1. 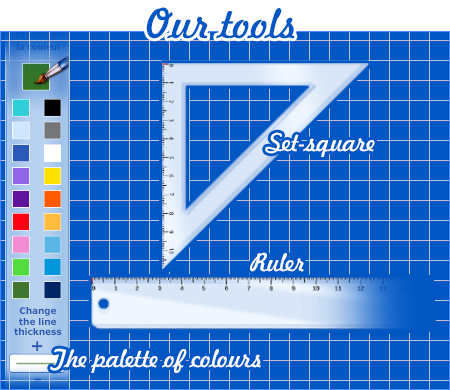 The set square. Drawing a right angle. 2. Distance between a point and a straight line. 3. Drawing and measuring the height of a triangle. 4. Kinds of quadrilateral. The rectangle, the square. 5. Drawing a rectangle using a grid pattern. 6. Drawing a rectangle when the length of the sides is known. Introducing units of hundred. Buying with Youpie money. 1. Introducing units of hundred. 2. Represent on Badix numbers containing hundreds. 3. Adding up numbers with hundreds. 4. 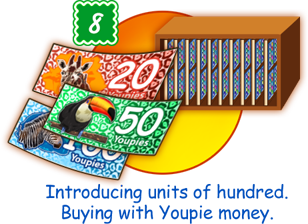 A currency to play with for buying things : youpies ! 5. Paying amounts made up only of tens or hundreds. 6. 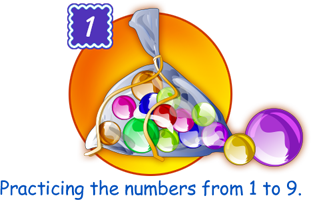 Know how to pay the exact amount with the least number of notes and coins. The two forms of subtraction. Mental calculations. 2. Subtractions without carrying numbers on Badix and on the slate. 3. Carry out a subtraction by giving the change. 4. Subtractions by completing the single units and the tens. 5. Subtractions by mental calculations. 6. Subtractions with carrying numbers. 7. Subtractions with carrying numbers on Badix and on the slate. 8. 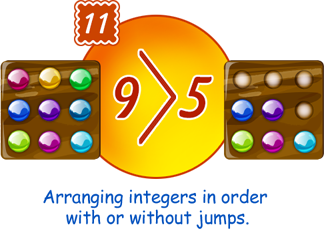 Subtractions by completing the single units, the tens and the hundreds. The compass, the circle and the disc. 1. The compass is used to draw circles and to measure distances. 2. Right angled triangle and rectangle inscribed in a circle. 3. Drawing two circles which do not intersect. 4. Drawing and properties of two circles which intersect at two points. 5. To measure a distance using a graduated compass. Translation tool. 6. To draw a triangle and measure its sides. 7. To draw a pearl necklace. 8. To construct parallels to a straight line passing through given points. Arranging integers in order with or without jumps. 1. Comparison of two natural integers. 2. To represent and compare two numbers on Badix. 3. Sort numbers from the smallest to the larger. 4. Sequence of successive integers with no jump. 5. Sequence of successive integers with a jump of 2. 6. Sequence of successive integers with a jump of 10. 7. Sequence of successive integers with a jump of 5. 8. Sequence of successive integers with a jump of 3. Shopping at the bakery, to pay and get the change. 1. To by bread, a croissant or a chocolate bread. 2. To buy three sandwiches for lunch. 3. To buy two sweets and get change on 50. 4.To buy 2 cakes and get the change on 500. The person who validates your answers. 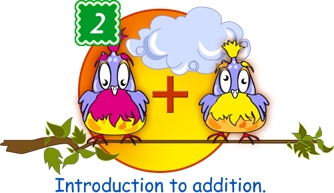 Primval teaches children how to make calculations by starting with the smallest whole numbers and progressively going up to 999. 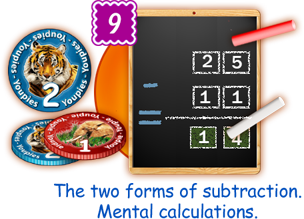 This first Primval software covers addition, subtraction and the enumeration of successive whole number groups, (skipping over numbers in 2s, 3s, 5s and 10s). 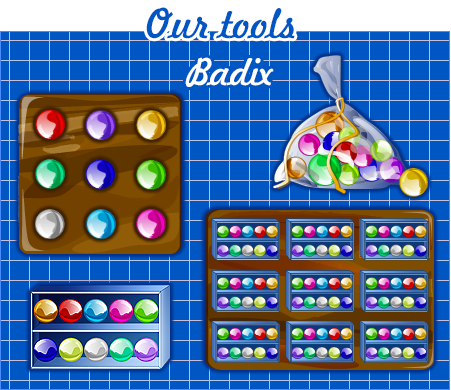 The basis of the calculations are made practical by short lessons and active exercises called Badix. 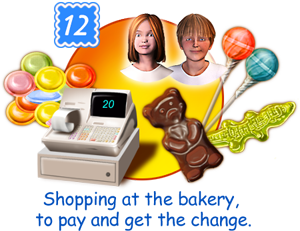 These activities use fun objects which are easy to manipulate. They represent single numbers, tens and hundreds. 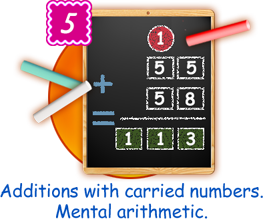 Each activity using these tools is then carried out in parallel on the blackboard and transferred to the Solution. 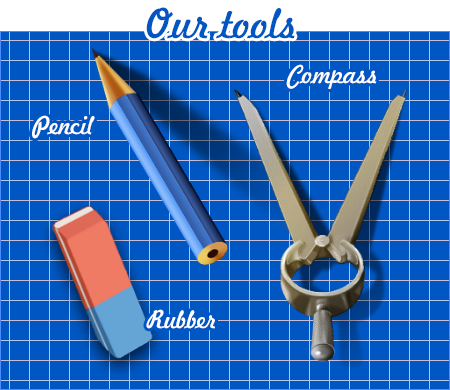 Using these tools helps a child to understand the use of a zero and the meaning of carried numbers in additions and subtractions. Three chapters are devoted to geometry. 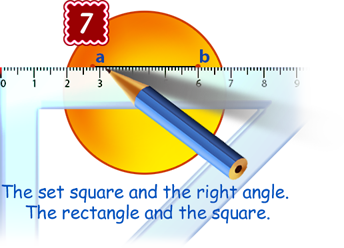 The pupil can use the basic tools which can be manipulated with one finger: point, lettering, pencil, rubber, ruler, set-square, graduated compass, a palette of colours. The main exercises involve drawing triangles, quadrilaterals, rectangles and squares. One exercise involves lining up a row of points. Several exercises use the compass to draw circles or to measure lengths. The radius and the diameter of a circle are introduced together with its main properties. Primval applies the Evalutel method. Every exercise is corrected step by step after the second mistake or if the child cannot find the answer. The mark obtained is shown as the child works through the exercise. The marks obtained are saved for each chapter and in detail. This provides instant feedback on the child’s level. In most of the exercises, the data is chosen at random which means that the child can do the exercise again and again with new data. The time spent and the marks obtained are shown on Primval’s main screen. The Primval application is available with iOS and Android. . It is meant for primary school pupils in the Preparatory class, the 1st and 2nd elementary classes..